What is the San Gabriel Valley Regional Pedestrian and Bicycle Master Plan? ​​​Want to feel more comfortable riding on city streets? Learn more about the rules of the road? Or how to set up your bike to commute to work/school? Click on the image below and sign up for a class today! The #ActiveSGV planning team is excited to announce that we are now able to offer classes for community groups, on a first come first served basis. If you are with a group or club of at least 10 persons and would like to request a City Cycling, Basic Bike Repair, or Traffic Skills 101 class, please contact Monica@bikeSGV.org. As always, more information can be found at www.activeSGV.com or #ActiveSGV. Traffic Skills 101 (TS-101) - In-depth instruction for those interested in taking a deeper dive in bicycle rules-of-the-road, skills, and techniques. Basic Bike Repair - Keep your bike rolling! This class will cover basic fixes, including flat repair, brake adjustment, and more. Email jose@bikeSGV.org for information on upcoming classes. Learn-to-Bike: City Cycling - Want to feel more comfortable riding on city streets? Learn more about the rules of the road? Or how to set up your bike to commute to work/school? 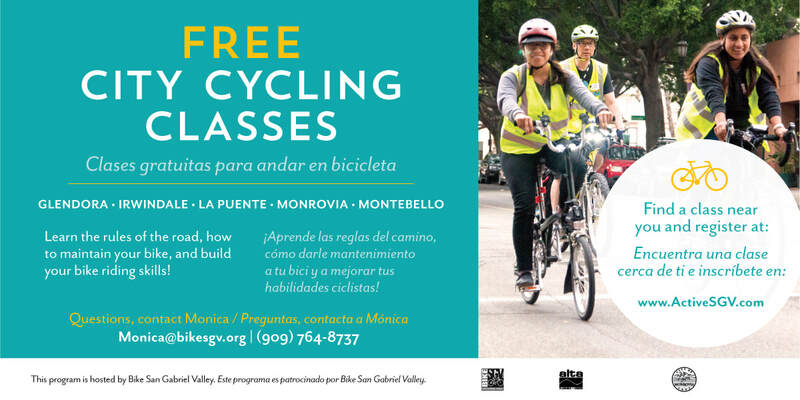 Email monica@bikeSGV.org for information on upcoming classes! Your Input Needed: Draft Plans! Want to see what a more pedestrian-, bicycle- and transit-friendly SGV would look like? Know any streets or intersections that are in need of safety improvements? If you missed one of the #ActiveSGV community input booths, you still have time to weigh in online. Review the draft plan recommendations and spot improvements here. Draft #ActiveSGV Plan | Community Input Booths!